Goodmorning, Everyone! This glorious morning I have a card I'm entering in a few challenges! 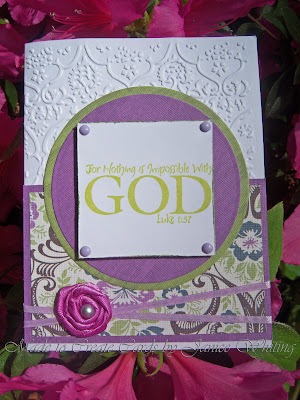 First off, I'm entering it into the Stampin' Sisters in Christ Challenge #35. They challenged us to make a card with flowers on it. The verse that inspired the challenge is Isaiah 40:8, "The grass withers, the flower fades, but the word of our God stands forever." Such a wonderful and encouraging word! The second challenge is Card Patterns sketch #60. This was a fun sketch to work with! oh, this is so sweet. I love the layout and the verse is awsome. Thanks so much for playing with us this week at Stampin Sisters in Christ. We hope to see you again!! Beautiful card, love your ribbon flower. Beautiful card - love purple! Thanks for playing at Card Patterns! Awww, what a beautiful card! I love your sweet rose. This is beautiful! I just love the embossing- I never seem to do that enough on my cards. Hi Janice - I love your card - the embossing is so elegant, especially with that gorgeous EF! Love that scripture and how you have made it the focal focus of your card! Love it! Thanks for playing along with us at the Stampin' Sisters in Christ Challenge this week, we love to see your cards and would love to see you next week again!